A biscotti with my morning cup of coffee is a nice way to start the day. I particularly enjoy these Gingerbread Biscotti, as they are not overly sweet, have chunks of hazelnuts, lots of raisins and chocolate chips, lovely flecks of rolled oats, just a hint of molasses, and are warmly spiced with ground cinnamon, ginger, and cloves. 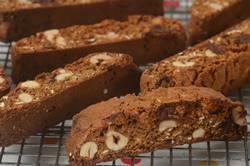 As with most biscotti, this Gingerbread Biscotti is a great recipe to play around with. For one thing, there many types of nuts you could use in this recipe. Although hazelnuts are my favorite, you could also use pecans, walnuts, or even almonds. Now, make sure to leave the nuts in fairly large chunks as you really want to see the nuts in the biscotti. For the raisins you could use either dark or golden. I also added some chocolate chips as they pair especially well with the hazelnuts. You could also add some dried cranberries or cherries, dried apricots, and/or dried figs. The second baking of the biscotti determines its texture. If you like your biscotti quite crisp and crunchy, which is perfect for dunking in your coffee, bake the biscotti the full eight minutes per side. But if you want them slightly softer, reduce the baking time to between 4-5 minutes per side. Gingerbread Biscotti will keep for several weeks in an airtight container. This recipe is based on a recipe from Karen DeMasco and Mindy Fox's excellent baking book "The Craft of Baking". Gingerbread Biscotti Recipe: Preheat your oven to 350 degrees F (180 degrees C) and place the oven rack in the center of the oven. Line a baking sheet with parchment paper. In a food processor, process 1/2 cup (45 grams) of the rolled oats until finely ground. In the bowl of your electric stand mixer, fitted with the paddle attachment (or with a hand mixer), combine the finely ground oats, the remaining 1/2 cup (45 grams) of rolled oats, flour, sugar, salt, baking powder, baking soda, and spices. In a separate bowl, whisk together the eggs, molasses, oil, and vanilla extract. Add to the flour mixture and, with the mixer on low speed, beat until combined. Scrape down the sides and bottom of the bowl as needed. Mix in the chopped hazelnuts, raisins, and chocolate chips and beat just until incorporated. Transfer the dough to a lightly floured surface and divide in half. Take each half of dough and form it into a log, about 9 inches (23 cm) long and 3 inches (7.5 cm) wide. Transfer the logs to the prepared baking sheet, spacing about 3 - 4 inches (7.5 - 10 cm) apart. Bake for about 30 minutes, or until golden brown and firm to the touch. Remove from oven and let cool on a wire rack for about 10 minutes. Transfer the logs to a cutting board and cut into 3/4 inch (2 cm) slices, on the diagonal. Place the biscotti, cut side down, on the baking sheet. Bake for about 6-8 minutes, turn slices over, and bake for another 6-8 minutes or until dry and firm. Remove from oven and let cool. Can be stored in an airtight container for several weeks.